If you are lucky enough to be in the Bahamas tomorrow (March 30) you may catch a glimpse of seven well-known charters cruising past, forming the Bahamas Flotilla. 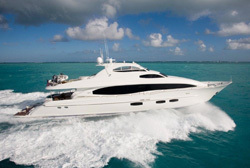 It is intended to introduce the Bahamas to charter brokers from all over the world. The opening night tomorrow will see the event kicking off with a Yacht Hop at Atlantis Marina. The brokers will visit Atlantis Marina, Albany Marina, Shroud Cay, Staniel Cay, Highbourne Cay, Thunderball Cave, using each of the seven yachts as a temporary base. Event organisers hope that after the brokers experience the beauty of the Bahamas that they will be better equipped to assist clients in booking charters in the region. As part of the four day itinerary the guests will be able to catch relax on the beaches as well as snorkel and feed iguanas. The financial significance of the event is reflected in the event sponsors which include The Bahamas Tourism Office, Atlantis Marina and Albany Marina who all value the opportunity that this collaboration presents. Plans are already underway for a January 2012 flotilla in the St Maarten-St. Bart’s-Anguilla region.